I recently found a cast iron name plate "Buffalo Car 1856." Does this ring a bell to anyone? 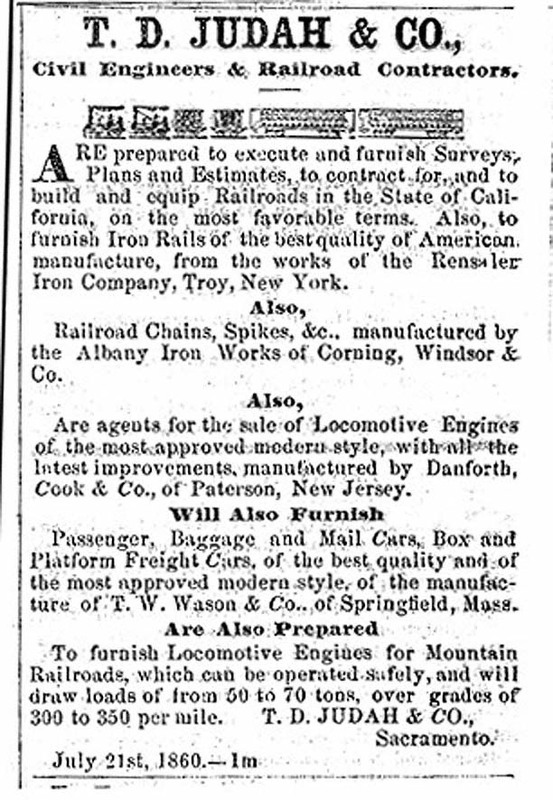 Attached is a copy of the ad in the Placer Herald, Auburn, Calif. ... of July, 1860, where [Theodore Dehone Judah] says he is looking for employment as a RR engineer, and has rail for sale, too. That rail ended up on the SP&N, Folsom to Auburn Station. This ad ran twice: July 21 and July 28, 1860. I recently came across a telegraph from the California Emigrant Association to the Department of Interior dated August 26, 1868. This group was active in the early 1870s and I believe is generally considered a CP-sponsored venture to encourage more immigrant traffic to the west, but I am surprised to see it functioning at this earlier date. Hearst at least was part of Stanford's circle of friends.